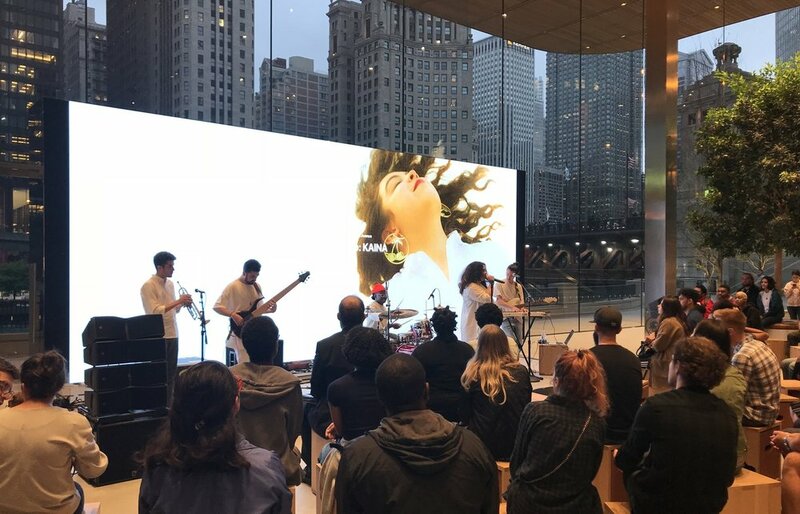 Apple's downtown Michigan Avenue location has announced their month-long Chicago Music Industry Summit. The programming was led by writer and podcaster Tara Mahadevan features a wide variety of panels, performances, labs and interviews with key people in Chicago's booming music scene. Initial programming includes performances from Joey Purp, Femdot, Omar Apollo, and Kweku Collins. Labs and panel talks include industry leaders like Andrew Barber (Fake Shore Drive), DJ King Marie, Brian Zisook (DJ Booth), Britt Julious, Olivia Goodman, Des Owusu, Ciera McKissick and more. Initial music labs feature Grammy Award Winning mix engineer L10MixedIt (Classick Studios), who has engineered projects like Chance The Rapper's Acid Rap, Smino's Blackswn and Noname's Telefone. A full schedule of events can be found at Apple.com/today. In a string of tweets posted after the summit announcement Mahadevan noted "I wanted to figure out a way to help Chicago's arts & music communities thru inclusive conversation and pooled resources." Additional tweets from Mahadevan noted the summits focus on Chicago's industry infrastructure; "I curated this summit so my friends + colleagues whom I greatly respect and admire can share their stores and show the gen [generation] the way. Chi doesn't necessarily have the same industry infrastructure as NY and LA; the summit ams to support our creatives by honing in on the business side." With Mahadevan's longstanding contributions to Young Chicago Authors, education for youth, up and coming artists and the community itself will be a major pillar of the summit. "I never thought I had a place in education, community work or activism till I met @KevinCoval & taught at @YoungChiAuthors #chicagobeat. Then I realized just how important is is to impart knowledge on the young and prepare them to someday take our place" she tweeted. Everything kicks off Wednesday, August 29th at 6:30PM with a conversation featuring DJ Rae Chardonnay, Ciera McKissick (Founder of AMFM) and Des Owusu (Fat Tiger Workshop). The evening will also feature performances by Kweku Collins and Loona Dae. RSVP for the kick-off event at Apple.com. The entire summit will run from August 29th to September 30th, 2018. The first two weeks of programming have been announced with the additional programming and announcements coming soon.